Unofficial build of CyanogenMod 13 is available for Oneplus 3. So in this post, i will show you How to Install OnePlus 3 CyanogenMod 13 in 5 minutes. To get started, you need a rooted Oneplus 3 With TWRP recovery. If you haven’t done already, we have a tutorial on how to root Oneplus 3 and Install TWRP recovery. 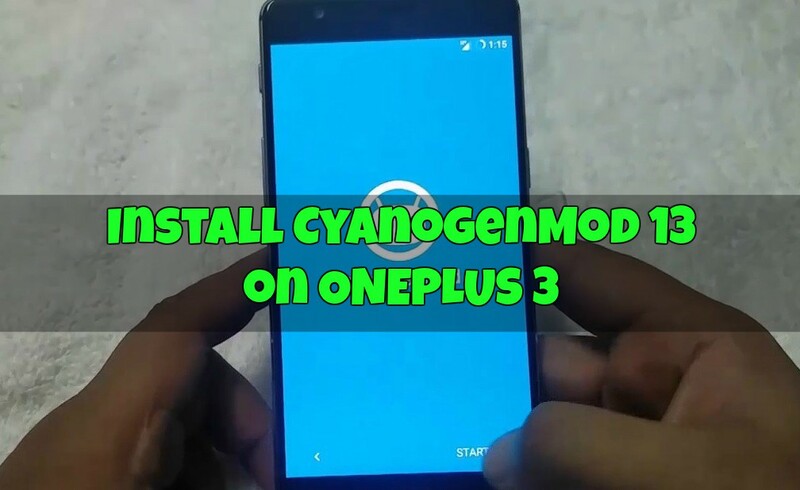 To install Oneplus3 CynaogenMod 13, you need CynaogenMod 13 Full ROM zip file and Gapps Package zip file to install the all the Google application on this custom ROM. CyanogenMod 13 is one of the most popular Custom ROM with lots of features and customization, which you can use on your Oneplus 3 after flashing this CM 13 ROM. Unofficial CyanogenMod 13 is based on the Android 6.0.1 Marshmallow. This guide is only for the Oneplus 3 users and don’t try this method on any other smartphone. Before following this guide do take backup of your data, because we are performing the full wipe to install the CyanogenMod 13 ROM. a) Rooted Onplus 2 with TWRP recovery. b) CyanogenMod 13 Full ROM Zip File. Download here. c) Gapps Zip file. Download form here. Step 1. Once CyanogenMod 13 Full ROM Zip File and GApps file are downloaded. Save then on your Oneplus 3 Internal Memory and rember the location. Step 2. Now boot your Oneplus 3 in recovery mode to flash the zip file on your phone. Step 3. From TWRP main screen, Tap Wipe and Swap to Factory reset. This will wipe all your data. So do take the backup of Oneplus 3. Step 4. Now back to main screen of Recovery. Tap Install, select CM-13 zip file and Swipe to Confirm Flash. This will take a minute to flash the zip file. Step 5. Once Completed, Go back to the main screen . Tap Install, select Gapps zip file and Swipe to Confirm Flash. This will take a minute to flash the zip file. Step 6. Once done, Wipecache/Dalvik. Step 7. GO back and Reboot > System. When you are booting in new Custom ROM. The first boot takes longer boot time than your standard boot time, Don’t panic and just wait. Now the CyanogenMod 13 ROM is installed on your Oneplus 3.